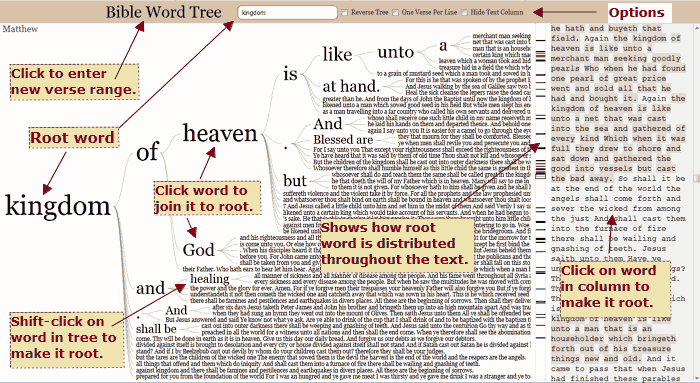 If no Root Word is entered, when the Bible Tree is initially generated it will use the first word of the text as the Root. To change the Root simply click a word in the text column on the right, shift-click a word in the Tree itself, or enter a word in the text entry in the header. To add words to the root click any word down a branch following the root. The tree will smoothly add the word(s) and adjust the display accordingly. To remove words simply click a word higher up a branch. If the whole Bible is entered to search and no root word entered it may take a few seconds for the Tree to display. Since the Tree generator selects the first word of the text as default, it is often a common word such as "In." With a common word more "hits" will be made and thus the generation will be slower. The Bible Tree Reference Entries utilize a dropdown suggestion list that displays when text is entered. Simply begin typing and select a book name. If a chapter is desired, enter it after the book, i.e. John 3. Below are some text entering options. If a single book is entered in the first entry, only that book will be used, i.e. Matthew. If a book is entered in the second Book entry, the Tree will use the text range between the books inclusive, i.e. Matthew and John respectively. The same is true if chapters are added, i.e. Genesis 5 and Exodus 10 or Exodus 12 and Joshua. A chapter span within the same book can be entered in the first Entry like Romans 1-6. In this case any entry in the second reference entry will be ignored. Any Bible word can be entered in the center Root Word Entry. If the word is not found the tree area will be blank, but a word can be selected from the text column area on the right. Pressing the Enter Key while in the Root (second) entry will build the tree. The first option will reverse the tree to show the words leading up to the root. The second will restrict the display of each line to the current verse. Otherwise the following (or preceeding) verse may continue the line. The third will hide the text column on the right that contains all the supplied text and show only the Bible Tree. The fourth is an experiemental option that will treat the entered word as a word "stem" or partial string. For instance, entering "right" and checking this option will also find "righteous," "righteousness," and "rightly." The stem and word ending will be separated by a dash (-). The last option will show the references for each line. Links can be used build a Bible Word Tree without the need of entering any data at this site. This makes it possible for webmasters to place Bible Word Tree links on their web site to generate a Tree. Only two parameters are required for a link to function: a Bible book name (with optional chapter) and a root word. Optional parameters are for a second Book, the Reverse function, and the Hide Text Column function. The required book is designated by rng1 followed by an = sign and then the full book name. For instance, rng1=john will make the book of John the search range or scope; rng1=john12 will only add John chapter 12. The second book (optional) is formatted the same except it is designated rng2, as rng2=romans. The Root Word is designated prefix as in prefix=life. The Reverse option is designated reverse as in reverse=1 for On. The Hide Column option is designated hide-text as in hide-text=1 for On. Any webmaster is welcome to create links and place them on their sites to utilize the King James Bible Word Tree.